Sony should not have called it a tablet. The unique clamshell device runs on Android OS 3.2 Honeycomb (upgradeable to OS 4.0 ICS in future), has two 5.5-inch TFT display sporting 1024×480 resolution, powered by dual-core 1GHz Tegra 2 processor, lets you play PlayStation certified games, SIM-enabled, built-in 1GB memory, supports external microSD card. Sony calls it a Tablet P, but it shouldn’t be marketed as a tablet. Here’s why this device does not work well as a tablet. Dual screen. Technically, 2 screens are better than one. The Table P has a combined resolution of 1024×960. Unfortunately, not all apps support the full-screen view. The result: only one screen can be used, so instead of a larger screen, you end up with a viewable screen size of a mere 5.5-inch. Dual screen does not quite work well when typing. At the normal “landscape” orientation, the Tablet P is too wide and its side bezels too thick for thumb typing. At the portrait orientation, some keys appear in between 2 screens! In general, the 2-screen design is not natural to use for most apps that are designed for single screen. Memory. Tablet P does not come with any built-in user memory to store user data. The 1GB is used by system. Without inserting an external memory card, you cannot say, take picture with the camera. I don’t know of any tablet that does not have built-in user memory. Sound. Sadly, the Tablet P sound quality is rather poor and weak. I was unable to impress my peers with video and music playback. OK, imagine this is not a tablet. Here’s what this device can do that sets it apart from other conventional tablets. Dual screen. Sony has customised several apps to showcase the dual screen capability. Here’s a list. Camera: top screen shows the list of previously saved content, the bottom screen shows the camera live preview. Video: top screen shows the content, the bottom screen shows the controls. Music: top screen shows the playback controls and artwork, the bottom shows the albums in the form of artwork thumbnails. You can interact with them by moving them around, as if they are physical albums laid on a table. Gallery: when opening an image to view, the top screen shows the main image, the bottom shows the rest of the images in the album which you can scroll. When you select another image, it will appear in the top screen. I really like how these apps make use of the dual screen. When you use these apps, they don’t look at all like tablet. Compact Clamshell. The Tablet P is a compact and portable tablet for such a large screen, at only 372g. The beauty of the clamshell design is that I can put the Tablet P on the table and tilt the screen to watch videos, as a bedside clock, or watch for incoming updates. Even when hand-holding the device, I can adjust the top panel for optimised viewing angle while holding the bottom panel in a comfortable position. My favourite feature is to be able to do video recording without the need of a stand. And with the live preview displayed at the bottom screen instead of the top, I could capture still and video images at odd angles, not unlike cameras with articulated screens. Notification light. No other mainstream tablets have a notification light. 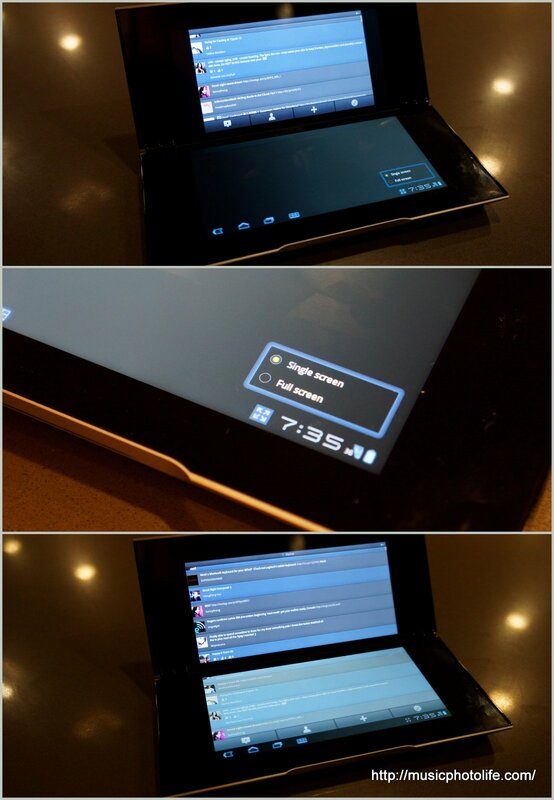 The Tablet P has it, so you’ll know when you need to turn on the device to read your incoming messages. Removable Battery. If you are a heavy user, you can easily buy extra battery to last you the whole day. Sony should not have called it a tablet. The Sony Tablet P is a personal touchscreen device, one that lets you play PlayStation games, enjoy music, video and photos, one that lets you capture photos and videos in various angles, one that connects to your social network via 3Gw. And it’s a device that runs on Android OS and that, by the way, supports all Android apps, which you may use but not optimised for the device. Maybe then, more people will find good reasons to buy it. Would you, if it’s not called a tablet?